We’ve officially devled into our second challenge of the year, partnering with local non-profit Forgotten Harvest to address food insecurity in Detroit. 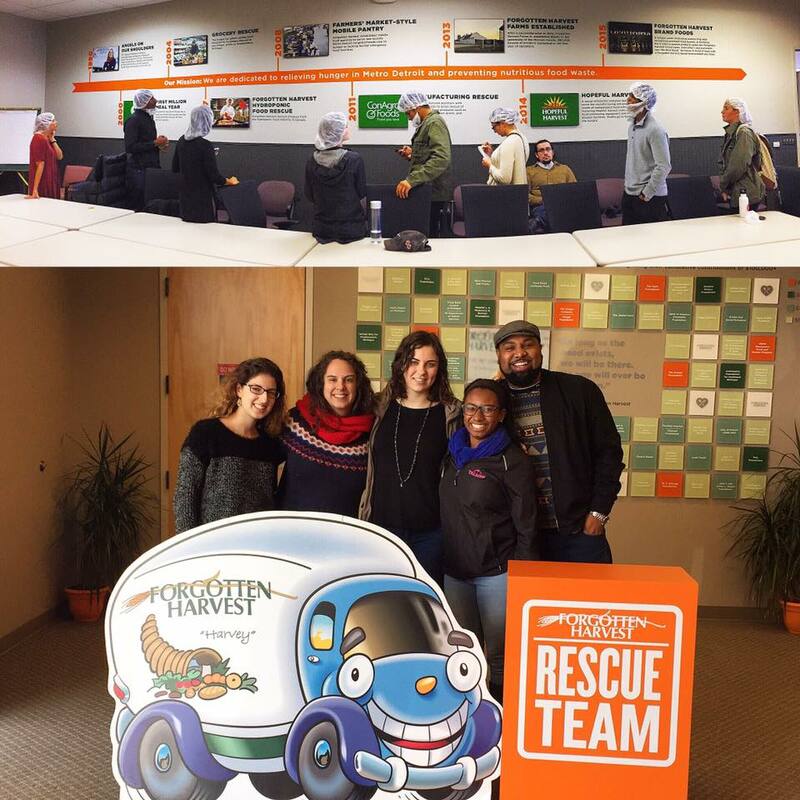 We kicked off last month with a visit to one of the agencies that receives food from Forgotten Harvest. While there, we participated in their pantry and helped pass out food to the community. I’ve entered this challenge completely ignorant to the concept of food insecurity, both on a personal and professional level. I have never experienced food insecurity in my own life, nor have I worked on projects involving the subject or volunteered with non-profits with missions that are focused on food insecurity. Because of this, participating in the food pantry had a shock factor for me. I couldn’t believe how many people came out to the pantry, in the cold, dragging wagons, boxes and bags behind them, to receive food from the church we were working with. I’m sad to admit that I never imagined that hundreds of people would line up to receive food. I’m sad to admit that I hadn’t even noticed that many of them had been lined up outside the door upon my initial arrival…they had been waiting for numbers. The church serves so many community members, they have to rely on a number system to keep things orderly and fair. I was blown away. As popular of a topic as food insecurity is, my inexperience in the matter left me vulnerable to the shock that comes when you realize how deep, vast and real the problem is. I went to bed thinking about it. For 24 years, I have been going to the grocery store and filling my cart to the very top without thinking about it for a second. For 24 years, I’ve been carelessly throwing away leftovers from expensive dinners and food in my freezer that I’ve grown tired of. All while members of my community were going to sleep wondering where their next meal was going to come from. The experience served as a reminder to myself (and others) about how important it is to get involved with our communities and develop a real awareness of the issues our friends, family, neighbors, co-workers and community members are facing. It shakes me to my core to think that I could have helped somebody overcome food insecurity in these 24 years, if only for the day, had I been aware of how real and close to home of a problem was. It’s embarassing. It’s embarassing to admit that I didn’t know. Embarassing…the word alone leads my mind down another path. How sad to say I’m embarassed, when I cannot imagine how embarassed the hungry in my community are. Check your privilege, check your privilege, check your privilege. The feelings of shock and awe continued when we toured the Forgotten Harvest facility. An entire facility devoted to feeding our community members. One of the employees we spoke with said something that really resonated with me in that moment…”our goal is to not be here someday”. Forgotten Harvest is doing absolutely incredible work. The way they’re able to mobilize people to feed our communities is mind blowing…but I can’t help but agree that I wish they didn’t exist. Furthermore, the experience within their facility is an entirely different experience than what you get when you’re out with the agencies benefiting from their work (receiving the food). Your experience within the facility is clean, expected and safe. Had we started with a tour of a facility and not volunteering with the church, I would not had experienced the same level of shock or wrapped my head around food insecurity in a real way. I’m thankful to have been presented with both experiences, and will continue to reflect on both and how they compare to one another throughout the challenge. I know that ending my post here is abrupt, but I suppose it’s fitting because we’re in the midst of this challenge, and my thoughts and reflections have ended as abruptly as this blog post for the moment. For now, this is all I have to share with you about my experience. I am continually grateful for these opportunities and reflecting 24/7 on my experience with Challenge Detroit and the non-profits we have the privilege of partnering with.